The sprawling Atlanta metropolis is home to excellent neighborhoods that offer comfortable living with access to a strong economy and an exciting range of cultural, historic, and recreational attractions. The hub of the ritzy and ultra-chic, many consider Buckhead Atlanta’s most lavish neighborhood. Everything happens in Buckhead – which isn’t surprising considering it’s the city’s economic center, as well as the location of luxury shopping malls, decadent restaurants and gourmet eateries, top-rated hotels, and more. Home to the Centennial Olympic Park, the World of Coca-Cola, the CNN Center, and so much more, there’s always something going on in the heart of the city. Home buyers looking for an exciting lifestyle will feel right at home here. With the High Museum of Art, the historic Fox Theatre, and the innovative Center for Puppetry Arts making their home here, Midtown has earned the reputation of being Atlanta’s “Heart of the Arts.” Along Peach Tree Street lies the Midtown Mile, an incubator for growth-driving local businesses. Standing out with bike-friendly, tree-lined streets, Victorian-style early 20th century homes, and a highly anticipated annual community festival, Inman Park overflows with charm and personality. Its roots date all the way back to 1912, when it rose as Atlanta’s first ever planned garden suburb. Brookhaven is Metro Atlanta’s newest city-within-a-city, operating as its own “submetro” since late 2012. It boasts a historic district that showcases highlights from Atlanta’s earliest days. Home buyers will find majestic million-dollar historic estates, mixed with early 20th century Craftsman and bungalow homes. One of Atlanta’s first suburban neighborhoods, Druid Hills features gorgeous Tudor homes, Mediterranean-style villas, and various other mansions and estates. An ideal neighborhood for families looking for a refreshing and quiet retreat, Druid Hills homes are nestled in acre-size lots shaded by mature trees. Want to live in a neighborhood where everything you need is just minutes away? Atlantic Station is a stand-out community where “live, work, and play” is your daily cocktail. It’s a great place to meet and mingle with people from other parts of the city, thanks to regular servings of pop-up craft stores, live music festivals, and many more unique events and attractions. Old Fourth Ward has come a long way from being known mostly for its historic sites and attractions, to becoming one of the hippest and mostexciting neighborhoods in Atlanta today. Residents take pride in sharing a hometown with one of America’s most iconic figures, Martin Luther King, Jr. The healthy, historic, and affluent Morningside/Lenox Park enclave maintains a strong reputation as one of Atlanta’s most desirable neighborhoods. Thriving natural surroundings provide a lush backdrop for this locale’s serene and friendly community, top-rated schools, and dynamic commercial district. 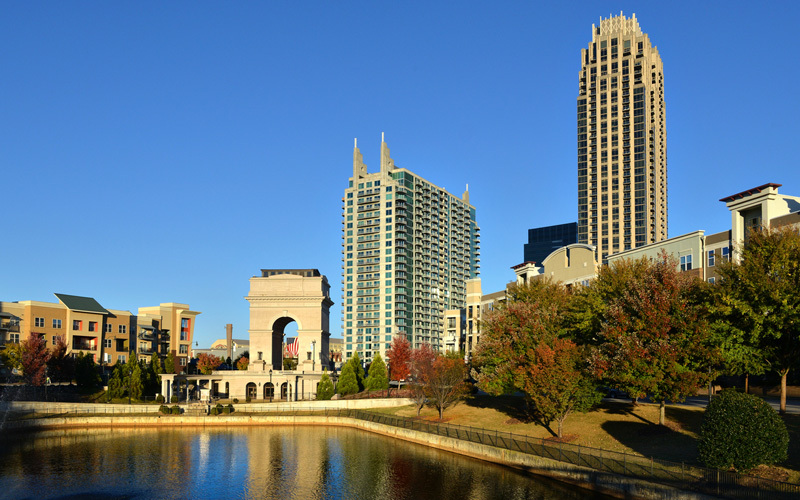 Explore opportunities in these Atlanta neighborhoods with me. I would love to help you find your dream home here. Consult with me anytime by calling 770-851-7638, emailing [email protected], or clicking here.